The inspected premises was an office building; the building was steel frame on a block and (presumably) grade beam slab on grade foundation, and approximately 14+ years old. The building was approximately 80+ feet at its north to south dimension and approximately 115+ feet at its east to west dimension. The lot size was not determined and not within the purview of this inspection. The HVAC system was inoperable at the time of inspection (and inoperable or partially inoperable over a long period of time) and would be somewhat costly to repair; taking this into account, the building was currently in below average condition for a building of this age and type. The following is a synopsis of the potentially significant improvements that should be budgeted for over the short term. Other significant improvements, outside the scope of this inspection, may also be necessary. Please refer to the body of this report for further details on these and other recommendations. REPAIR COST ESTIMATES ARE NOT GUARANTEED AND ARE PROVIDED AS A GUIDE, ONLY. BONA FIDE ESTIMATES SHOULD BE OBTAINED FROM LICENSED CONTRACTORS. Estimates for repair costs are based on current rates of professional licensed contractors. The client should understand that some contractors, repair or service firms may make misleading and/or inaccurate reports of the condition of items in an effort to sell repairs and/or replacements which may not be needed. Bona Fide Repair costs should be determined prior to closing. The building inspection is a screening process to alert the client to general deficiencies at the property. The purpose of this inspection is to identify and disclose visually observable major deficiencies of the inspected systems and items at the time of inspection, only. 1. 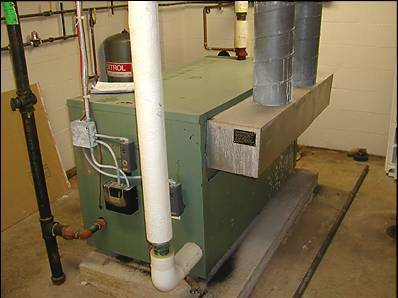 HVAC (Hydronic Heating): heating was supplied by a gas-fired hot water boiler to baseboard radiation for the perimeter rooms and to a VAV (Variable Air Volume) fan terminal unit for the 1st floor lobby and the hot water fan coil unit for the vestibule. The heating system was controlled by a central controller at the boiler room (see picture #6 in the Heating section) and by individual wall thermostats at each floor; the wall thermostat controls the cooling of the variable air volume (VAV) terminal, and the perimeter heating (where applicable). There were approximately 10 heating zones per floor. The gas-fired forced hot water boiler appeared to be adequately sized (Input 560 MBH, Output 448 MBH), approximately 14 years old, and in operable condition at the time of inspection (see picture #1 and illustration, below); flame and draft were acceptable and the circulator was operable; the relief valve was releasing at the time of inspection(see picture #2 in the Heating section); this may be caused by a faulty or waterlogged expansion tank, a defective pressure reducing valve, or due to some other cause; corrections are recommended by a competent and licensed heating contractor or plumber. 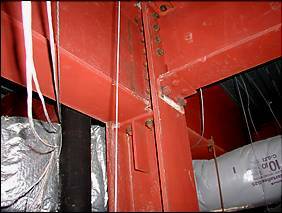 The construction debris should be removed from under the make up air intake at the boiler room. It should be noted that the boiler is beginning to near the end of its average useful service life; boilers of of this type typically last 20-25+ years. The boiler and hot water pump are controlled by the main controller (at boiler room-see picture #6 in the Heating section) which resets the boiler water temperature from outdoor and indoor sensors, and cycles the pump on demand. The boiler water temperature is maintained at a minimum of 140 degrees F and is reset upward as the outdoor temperature falls. The controller provides night set back and morning warm-up boost. The night set-back periods are determined by the program clock which accepts a seven day schedule. This system controls the boiler. The rooftop air conditioner is on a separate schedule. The inspection and testing of the heating system controls are not within the purview of this inspection; the entire heating system should be inspected by a competent and licensed HVAC contractor after the air conditioning repairs are performed (see the Air Conditioning/Ventilation section). a.) some of the baseboard convector heating zones at all three floors were not heating up at the time of inspection when activated by the wall thermostats (including the 1st floor southwest office zone, the 3rd floor northwest off zone, and possibly elsewhere); this may be caused by faulty zone valves, zones being air bound, or due to some other cause. b.) 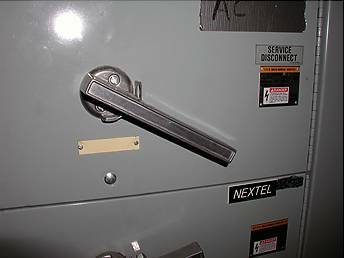 as the HVAC system was shut down at the time of the inspection, the vestibule fan coil unit was inoperable at the time of inspection (see picture #8 in the Heating section). 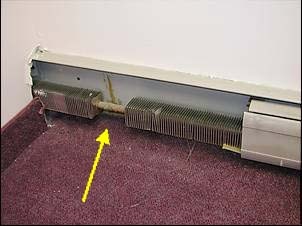 There was also a fan coil unit that appeared to supply heat to the plenum at the 1st floor lobby and east side offices (see picture #7 in the Heating section); as the lobby temperature was approximately 78F at the time of inspection, the unit did not activate and, therefore, was not inspected. c.) some of the heating line supply valves behind the 1st floor suspended ceilings were dripping and leaking onto ceiling tiles below (see pictures #4 and #5 in the Heating section); most of the leaky valves were at the 1st floor east side offices; all valves should be inspected by a competent and licensed heating contractor or plumber and repairs performed where necessary. d.) there were missing or damaged baseboard convector housings in areas at the 3rd floor offices (see picture #3 and illustration in the Heating section); repairs are recommended. e.) the inspection was not technically exhaustive and there may be additional deficiencies not noted in this report. The heating distribution system (including the boiler main controller-see above, perimeter heating at offices at all floors, vestibule and lobby fan coil units, etc.) should be thoroughly inspected by a competent and licensed HVAC contractor and corrections performed where necessary and prior to closing. The client is advised to contract with a competent and licensed HVAC contractor to eliminate the long-standing and chronic deficiencies of the past and to insure the proper operation of the HVAC system in the future; also, see the Air Conditioning/Ventilation section for further commentary. ESTIMATED REPAIR COSTS: see ESTIMATED REPAIR COSTS (HVAC System) in the next section. 2. 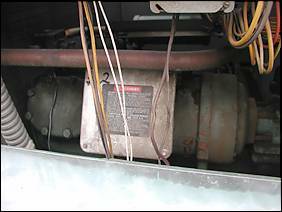 HVAC (air conditioning and ventilation): the HVAC system was a Carrier rooftop package unit, model # 50DL064, approximately 55 tons capacity, and approximately 14 yrs. old; the package unit incorporated two compressors; compressor #1 had been replaced recently at the cost of approximately $8000 according to the building manager (see picture #1 in the Air Conditioning section); compressor #2 was inoperable at the time of inspection (see picture #2 in the Air Conditioning section); in addition there was a problem with the main fuse serving the system (also according to the building manager) and the system had been entirely shut down for repairs (see picture #3 in the Air Conditioning section). Consequently, there was no air conditioning or ventilation (see commentary below) at the time of the inspection and the system could not be operated or inspected. Note: this consultant is not required to provide an opinion on the condition of any system or component that is shut down. However, the consultant is to provide an opinion of its physical condition to the extent reasonably possible, considering its age, obvious condition, manufacturer, etc. 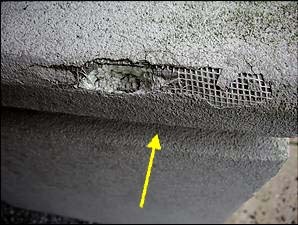 Two of the mesh filter screens were missing at the rooftop package unit air intake (see picture #4 in the Air Conditioning section); corrections are recommended. 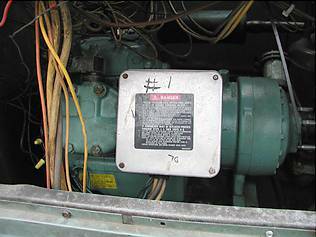 Even if made operable (compressor replaced and other repairs performed), the package unit was 14+ yrs., in somewhat worn condition, had operated erratically, and had been marginally or poorly maintained over a long period of time as determined by direct observation and through interviews with the owners and tenants (several of the tenants had stated that the system had chronic and constant problems over a long period of time); although package units of this type typically have a service life of 25+ yrs., replacement of the entire package unit may be necessary within 5+ yrs. According to XYZ Engineering (the company that had recently performed repairs at the system), replacement of the inoperable compressor and other repairs would cost approximately $15,000 and replacement of the entire package unit would cost approximately $60,000; taking into account the cost of near term repairs, the current age and condition of the unit, and the fact that the system had been marginally or poorly maintained over a long period of time, it may be cost effective to replace the entire package unit. It should be noted that a request was made of XYZ Engineering (see commentary above) to have the technician that performed the work call this inspector (within 2 days) in order to obtain additional information on the specific repairs performed; however, no call was ever received from the technician and the scope of the repairs were not determined. Comprehensive repairs (or replacement of the unit) are recommended prior to closing; a consultation with a licensed HVAC contractor is recommended for further analysis and for alternative bona fide repair cost estimates. HVAC Distribution: the distribution system was a variable air volume system (VAV) with electric damper actuators at terminals (moduboxes); approximately 1/3 of the electric damper actuators (see picture #5 in the Air Conditioning section) had been inoperable and had been recently replaced according to XYZ Engineering, who had performed the repairs recently at the HVAC system; replacement of other original units may be necessary in the not so distant future. There was a loud buzzing being emanated at the 3rd floor west side electric damper actuator circuitry; this should be further reviewed by a HVAC contractor when the other aforementioned repairs are performed. As the client is to occupy the 3rd floor (top floor), it should be noted that the large HVAC package unit is located in the middle of the roof directly above the 3rd floor offices; there may be noise and vibration from the unit; the client is advised to perform a “walk through” after the system has been repaired and activated to directly observe any noise and vibration being emanated from the unit. 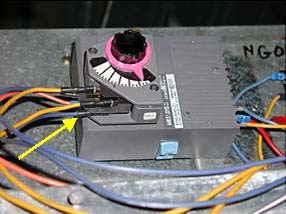 There were two condensing units located at the northeast and northwest areas of the roof; the northwest unit was inoperable according to the seller and served a prior tenant at the building; the northeast unit appeared to cool the cellular phone room at the basement (this room was locked and not accessible to this inspector); these units were not inspected. Ventilation and “Sick Building” Syndrome: the term “sick building syndrome” applies to any building in which a significant portion of the occupants, usually more than 20%, experience a set of symptoms, including headaches, fatigue, etc. that ameliorate when the affected persons leave the building. Many of the tenants interviewed by this inspector complained of such symptoms. In addition recent environmental testing performed by the XYZ Environmental Corporation (performed on 10/9/02) determined that there was unsafe carbon dioxide levels at the 1st and 2nd floors; this information was provided by XYZ Systems (tenant on 2nd floor); obtain further information and a copy of the report from XYZ Systems. Much of the cause of this situation appeared to be caused by the HVAC system being inoperable or partially inoperable over the years (see commentary above) and to lack of fresh air intake; the most important factor in dealing with indoor air quality is ventilation. When the HVAC system is finally made operational, the system should be tested for proper ventilation and proper fresh air intake. Environment Testing: the inspection and report do not address and are not intended to address code and regulation compliance, the possible presence of or danger from asbestos, lead paint, urea formaldehyde, molds, soil contamination and other indoor and outdoor substances. Environmental testing was not performed. Taking into account the poor maintenance history of the HVAC system, testing by an environmental testing company or laboratory may be advisable. Overall, the HVAC system was shut down and currently inoperable; from observation of the system and through interviews of the owners and tenants, it appeared that the HVAC system (including the hydronic heating noted in the prior section) had been marginally or poorly maintained over a long period of time and there was no evidence of a current maintenance contract; obtain further information from the seller. The entire HVAC system (including-but not limited to-the package unit, fresh air intake and economizer modes, hot water boiler system, all heating and cooling controls, fan coil units at the lobby and vestibule, the entire distribution system, etc.) should be thoroughly tested by a competent and licensed commercial HVAC contractor after repairs are performed and prior to closing. A service contract should be obtained from a competent and reputable HVAC contractor so that the entire system operates normally and so that the chronic and long-standing problems of the past are eliminated. 3. 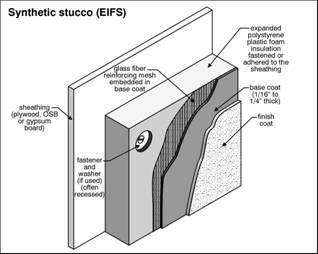 Exterior (Exterior Cladding): the exterior cladding was curtain wall glazing and a exterior insulation and finishing system (EIFS); see illustration, in the Exterior section; the exterior cladding appeared to be a barrier system. 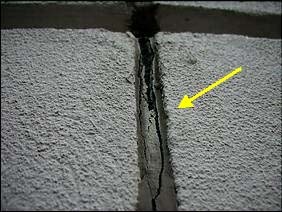 The vertical expansion joint caulking was in significantly worn condition throughout the building exterior (see pictures #1 and #2 in the Exterior section); there were approximately 4-6 vertical expansion joints per elevation; repairs are recommended by a competent and licensed waterproofing contractor. It appeared there had been miscellaneous areas of water penetration at the exterior cladding over the years and spot caulking had been performed when necessary; this including at windows, curtain wall glazing, the intersections of the EIFS and curtain wall glazing, etc. 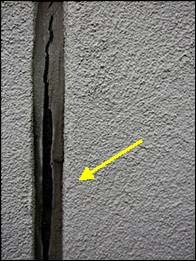 There was extensive deterioration at the “bullnose” trim band (EIFS) that extended the full circumference of the building (between the 1st and 2nd floors) and for approximately 400-500 linear feet (see picture #4 in the Exterior section); the deterioration appeared to be of the base and finish coats and appeared to be primarily caused by water streaming down the exterior cladding and eroding the trimwork over time and/or deterioration caused by retained snow (see picture #6 in the Exterior section); this type of deterioration is not unusual with trimwork of this type; there appeared to be some evidence of water intrusion into the interior space at the aforementioned areas as a result of the aforementioned deficiencies- including discoloration of steel framing just inside and opposite the aforementioned areas (see picture #5 in the Exterior section). There was significant water damage at the 1st floor northwest office and evidence of former water penetration at the exterior cladding at that area (see picture #3 in the Exterior section); repairs had been performed and according to the tenants there had been no leakage since. There was extensive deterioration at most of the roof parapet wall (EIFS) which appeared to be primarily caused by weathering and possibly poor initial quality (see picture #9 in the Exterior section); this damage also appeared to be at both base and finish coats; there also appeared to be some mechanical damage at the parapet wall (contact with ladders, scaffolding, etc.). There appeared to be approximately 400-500 linear feet of parapet wall. There was damage at the front entrance right side column EIFS (see picture #7 in the Exterior section). There was also miscellaneous deterioration at the exterior cladding in areas (see picture #8 in the Exterior section); all EIFS cladding should be inspected when the aforementioned repairs are performed and additional spot repairs performed where necessary. EIFS has encountered a bad reputation in some areas, because of problems with water penetration and resultant deterioration and failure. This is most common in low-rise residential buildings and buildings in coastal regions. This is typically not the fault of the system, but rather because of poor detailing around penetrations such as doors and windows. 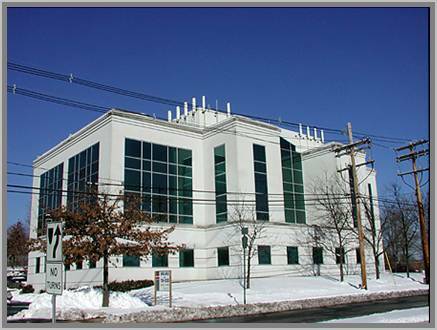 Commercial EIFS is typically of much higher quality than residential EIFS. However, the pros and cons of EIFS will not be discussed here. Comprehensive repairs of the aforementioned areas of deficiency are recommended by a contractor specializing in EIFS repairs. 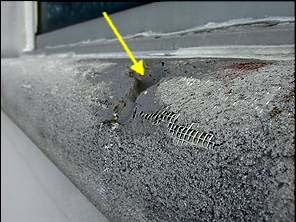 Repair of damaged EIFS would be a very specialized repair and may involve the troweling on of base and finish coats where necessary, would probably be labor intensive and costly. 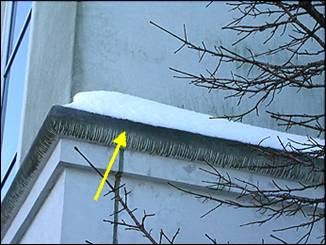 A consultation with a certified EIFS inspector or a contractor specializing in EIFS repairs is recommended for further analysis and for a bona fide repair cost estimate; primary areas of investigation should be the roof parapet wall and the curved ornamental trim band. It should be noted that swing stages or scaffolding will probably be required for the aforementioned repairs adding to the cost. There was significant dirt, mold, moss growth, etc. at the upper areas of the north side exterior stucco cladding (see picture #10 in the Exterior section) and miscellaneous dirt at other areas of exterior cladding; repairs are recommended at some point in the near future. The detailing including the flashing details at the curtain wall system was not inspected and is not within the purview of this inspection; consultations with a certified EIFS inspector, an architect or qualified and licensed engineer may be advisable for analyses. ESTIMATED REPAIR COSTS (EIFS Repairs-General Range): difficult to determine due to the specialized nature of the EIFS repairs; possibly $18,000.-$30,000; obtain a bona fide estimate from a licensed contractor specializing in EIFS repairs prior to closing. b.) Parking Lot Retaining Walls: there were long retaining walls at the middle of the parking lot and at the south end of the parking lot; several of the weep holes at the parking lot block retaining walls were filled with plant roots (see picture #12 in the Exterior section); there was also miscellaneous settlement cracking at the walls in areas which is not uncommon in walls of this age and type (see picture #13 in the Exterior section) repairs are recommended and the weep holes must be kept clear in order to relieve hydrostatic pressure at the walls and to prevent heaving of the walls. c.) Sidewalk and Walkways: the north side sidewalk (near entrance) had settled and the control joint material or packing had worn away at most areas (see picture #15 in the Exterior section); there was unevenness and tripping hazards at the north side sidewalk (near entrance), and at the south and west side sidewalks (see picture #14 in the Exterior section); there was also a raised utility access at the east sidewalk that posed a tripping hazard (see picture #16 in the Exterior section); repairs are recommended and will probably involve the leveling off of unevenness with concrete (at tripping hazards) and/or the pouring of new sidewalk sections at some point (at the north side sidewalk). ESTIMATED REPAIR COST (items noted above and excluding replacement of the north side sidewalk-near entrance): general range: $5,000.-$8,000.+; obtain bona fide estimates from licensed contractors); pouring of new north side sidewalk (approximately 100+ linear feet): difficult to determine; possibly $3000.-$4500.+; obtain a bona fide estimate from a licensed contractor. 5. 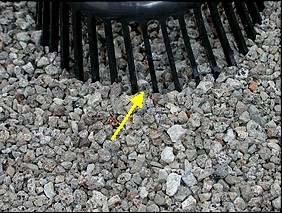 Roof: the main roof and lower roofs were low slope built up roofing with a flood coat of asphalt and gravel, and approximately 14 yrs. old (see picture #1 and illustration below). The roof plans for the building were not available and the roof specifications (including number of roof plys) were not determined. a.) 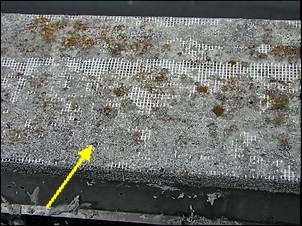 there was missing gravel or scouring at the roof surface in areas including at the east and west end of the HVAC package unit (see pictures #2 and #3, below), and at other areas; there was blistering of the roof surface at the east end of the package unit (see picture #4, below); repairs and the reintroduction of gravel is recommended. b.) 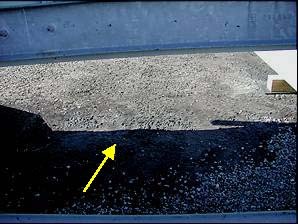 the northwest roof drain was blocked with gravel (see picture #5, below); corrections are recommended. c.) there was water staining and evidence of former roof leakage (possibly current) at the 3rd floor ceilings; at the 3rd floor east fire stairway ceiling, at the 3rd floor south hallway ceiling, at the 3rd floor west ceiling (near exterior wall), at the 2nd floor south and northwest ceiling areas, at one 1st floor southeast office ceiling, and at other areas (see pictures #7 and #8, below); several areas of water staining was at areas directly below or in the vicinity of the large HVAC package unit on the roof; areas were dry at the time of inspection as tested by the moisture meter. According to the building’s manager, there was no current roof leakage and spot roof repairs had been performed over the years. The purview of this visual inspection is only of conditions existing at the time of inspection at readily accessible areas. It is recommended that the client or a roofing contractor inspect the premises during a period of sustained rainy weather to determine the existence of roof leakage under those conditions. There was a significant amount of roof flashing and roof projections at the roof primarily due to the existence of the cellular phone company complex on the building’s roof, due to the large rooftop HVAC package unit, etc. 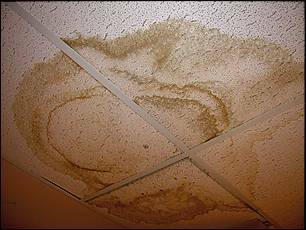 ; the aforementioned conditions are a potential source of roof leakage. 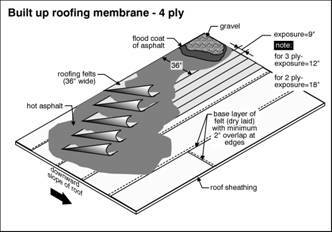 It should be noted that built up roofs are difficult to inspect as the roof membrane is not visible; the purview of this visual inspection is only of conditions existing at the time of inspection at readily accessible areas. 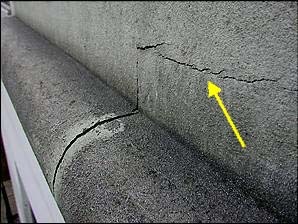 This type of roof is also more difficult to repair. Repairs are recommended by a competent and licensed commercial roofing contractor; all roof flashing should be thoroughly inspected and retarred or otherwise corrected where necessary when the aforementioned roof repairs are performed; a consultation with a competent and licensed roofing contractor is recommended for further analysis and for a bona fide repair cost estimate; roof repairs should be performed prior to any renovation of the 3rd floor offices. The central roof area was poorly or marginally sloped (at HVAC package unit) and water had ponded at the east side of the HVAC package unit (potential source of roof leakage-see picture #7, below); the inspection was performed during fair weather and there may be more significant ponding during periods of sustained inclement weather; this area should be kept well sealed and proper slope should be provided at the next roofing. Roofing of this type has a typical average service life of 20 years and the roof is nearing the end of its average useful service life; reroofing may be necessary within 3-4 yrs. A new roof installation will probably be much more costly than usual because of the cellular phone company complex on the roof and the very significant number of roof flashings, interruptions of the roof surface, etc. The building was one of the highest buildings in the immediate area and subject to high winds with resultant problems (e.g. 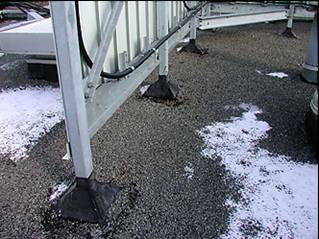 scouring of the roof surface, damage to and premature wear of rooftop components, etc. ); the roof should be periodically and regularly inspected. A more detailed roof inspection can be contracted for at the discretion of the client and would involve cut tests and/or thermographic scans and is not within the purview of this inspection. 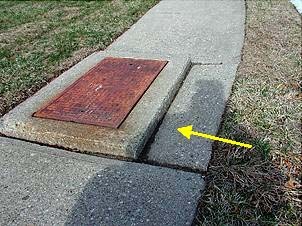 The roof drains discharged into subsurface drains; the condition of the subsurface drains could not be determined by a visual inspection; it is recommended that the drains be inspected during periods of sustained rainy weather (or otherwise inspected) to determine the serviceability of the drains. ESTIMATED REPAIR COSTS (near term roof repairs): $3000.-$5000.+; (reroofing-possibly within 3-4 yrs. ): $14,000.-$22,000.+; obtain bona fide estimates from licensed roofing contractors. 6. Electric: according to interviews conducted at the premises there had been a significant problem with employees at the XYZ offices on the 1st floor getting “shocked” when operating computers, etc. This appeared to have been caused by the neutral and ground terminals at the 1st floor step down transformer not being strapped together. Repairs had been performed and according to follow-up interviews, the problem appeared to have been solved; obtain further information from Mr. John Doe, the president of the XYZ corporation. It was not determined if there was a similar problem at the other floors although there had been no complaints from any other tenant; however, much of the building was unoccupied and interview information was limited. 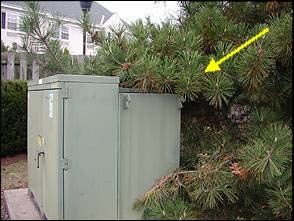 The pad mounted exterior transformer at the west side of the property was improperly obstructed by branches (see picture #1 in the Electrical section); there should be clearance at the front and rear of the unit; corrections are recommended. 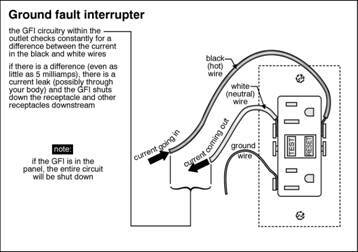 The installation of GFI receptacles at the kitchen counters where applicable is recommended (see illustration in the Electrical section). GFI devices are extremely valuable, as they offer an extra level of shock protection especially at potentially damp areas. GFI receptacles have been required by the National Electrical Code since the 1970’s and at kitchen counters since the late 1980’s. There was no lighting at the 3rd floor east side fire stairs; repairs are recommended. 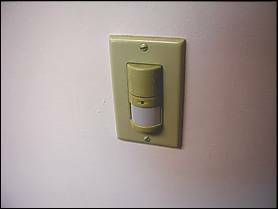 The motion sensor light switches at the 3rd floor offices were not inspected or tested (see picture #4 in the Electrical section). The parking lot lighting was on a timer and was not inspected; also, see the Proposal and Inspection Agreement; a guarantee of serviceability can be provided by the seller that the parking lot lighting is in operable condition. 7. Structure: the structural plans were not available for the building; however, the building appeared to be steel frame (see pictures #1 and #2 in the Structure section) on a block and grade beam slab on grade foundation; there appeared to be perimeter foundation footing drains which would be a standard building practice. A fireproofing paint had been applied at the steel framing. There was no overt evidence of any major structural deficiencies at the property at readily accessible areas and where randomly inspected; the block foundation walls were in generally serviceable condition where readily accessible; however, visual access at the interior foundation walls (at basement) was restricted or denied as a result of stored office goods; the purview of this visual inspection is only of conditions existing at the time of inspection at readily accessible areas. Buildings tend to settle in the first 10-20 years and future settlement of the building’s foundation walls may occur; however, only long term monitoring can determine ongoing settlement or movement. This inspector is not a structural engineer and a structural engineering analysis is beyond the scope of this inspection. A consultation with a structural engineer may be advisable for a further and more complete analysis. There was a cellular phone company complex on the building’s roof (with cellular phone components, antennae, superstructure, etc. ); there had been modifications and reinforcement performed to the structure when the aforementioned work was performed (see picture #3 in the Structure section); however, the determination of the ability of the building’s framing and structure to support such dead loads is not within the purview of this inspection; a consultation with a structural engineer may be advisable and at the client’s discretion. 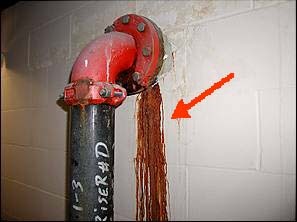 There was evidence of water intrusion at the east foundation wall where the fire protection water main entered the building (see picture #4 in the Structure section); repairs are recommended. Although firewall separation appeared to be in generally acceptable condition, there were areas of missing firewall separation behind the suspended T bar ceilings in areas including at the 3rd floor northwest corner area, at the 2nd floor south area near HVAC terminal, at the 2nd floor northwest office, and at other areas (see pictures #5 and #6 in the Structure section); these conditions are not unusual in a building of this age and type and is typically caused by fire separation drywall being either removed or damaged when occasional repair work is performed; areas behind the suspended ceilings were only randomly inspected and there may be additional areas of missing or damaged firewall separation; all areas of fire separation at all floors should be inspected by a competent and licensed contractor and repairs performed where necessary. ESTIMATED REPAIR COST (repair of firewall separation and water intrusion at the east foundation wall): difficult to determine; possibly $1500.-$2500.+; obtain a bona fide estimates from licensed contractors. 8. Plumbing, etc. : both toilets at the 3rd floor ladies lavatory were leaking at flushometer plumbing (see picture #3 in the Plumbing section); repairs are recommended by a competent and licensed plumber. The rooftop ventilator fan serving the lavatories was either shut down or inoperable; as a result there was inadequate ventilation at the lavatories; this deficiency was confirmed by the tenants who all complained of inadequate lavatory ventilation; system may be controlled by a timer and timer requires adjustment or repair; corrections or repairs are recommended prior to closing. ESTIMATED REPAIR COST (Lavatories): $200.-$300.+; (Rooftop Ventilator): not determined. ESTIMATED REPAIR COST: $400.-$500.+; obtain a bona fide estimate from a licensed contractor. a.) Bona Fide Estimates obtained from XYZ Engineering: repair of HVAC system (air conditioning, ventilation, only) $15,000.+; replacement of package unit: $58,000.+. 2. EXTERIOR (EIFS Repairs-General Range): difficult to determine due to the specialized nature of the EIFS repairs; possibly $18,000.-$30,000; obtain a bona fide estimate from a licensed contractor specializing in EIFS repairs prior to closing. 3. EXTERIOR (REMAINDER): (items noted above and excluding replacement of the north side sidewalk-near entrance): general range: $5,000.-$8,000.+; obtain bona fide estimates from licensed contractors. 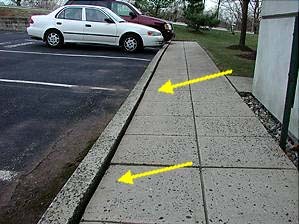 (items noted above and excluding replacement of the north side sidewalk-near entrance): pouring of new north side sidewalk (approximately 100+ linear feet): difficult to determine; possibly $3000.-$4500.+; obtain a bona fide estimate from a licensed contractor. 4. ROOF: (near term roof repairs): $3000.-$5000.+; (reroofing-possibly within 3-4 yrs. ): $14,000.-$22,000.+; obtain bona fide estimates from licensed roofing contractors. 6. 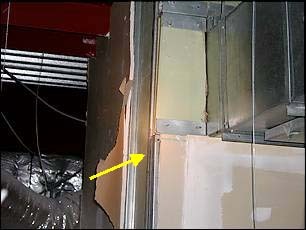 STRUCTURE (repair of firewall separation and water intrusion at the east foundation wall): difficult to determine; possibly $1500.-$2500.+; obtain a bona fide estimates from licensed contractors; areas behind the suspended ceilings were only randomly inspected and there may be additional areas of missing or damaged firewall separation. 7. PLUMBING: (Lavatories): $200.-$300.+; (Rooftop Ventilator): not determined. a.) Fire protection equipment, fire regulation compliance, building code and municipal bylaw compliance, Americans with Disabilities Act requirements, security systems, telecommunication systems; obtain periodic inspection information from the companies under contract. b.) Low voltage wiring systems of any kind. c.) Elevator System; periodic inspection information should be obtained from the elevator company under contract. It should be noted that the elevator cab “lurched” during operation; further review by the elevator company is recommended and corrections performed where necessary. 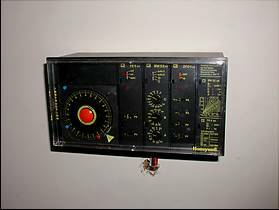 e.) Systems that are on timers or automatic controls including, but not limited to, parking lot lights and any exterior lighting, main boiler controller, thermostats where applicable, etc. Systems will be operated with normal user controls, only (e.g. thermostats at office suites). f.) Systems that are shut down or not operational at the time of the inspection. h.) THE INSPECTION AND REPORT DO NOT ADDRESS AND ARE NOT INTENDED TO ADDRESS CODE AND REGULATION COMPLIANCE, THE POSSIBLE PRESENCE OF OR DANGER FROM ASBESTOS, LEAD PAINT, UREA FORMALDEHYDE, MOLDS, SOIL CONTAMINATION AND OTHER INDOOR AND OUTDOOR SUBSTANCES. ENVIRONMENTAL TESTING IS NOT TO BE CONDUCTED. The client is urged to contact a competent specialist if information, identification, or testing of the above is desired. Also excluded: testing for water quality, sump pumps, door buzzer and intercom systems, lawn sprinkler systems, the presence of rodents and insects. l.) Preparing engineering calculations to determine the adequacy of any system or components or the compliance adequacy of any system or components with any specific or commonly accepted design requirements or building codes, or preparing designs or specifications to remedy any physical deficiency. m.) Reporting on the presence of pests, such as rodents or insects. Furthermore, the consultant is not required to suggest a treatment or remediation, determine the extent of infestation, nor provide opinions of probable cost for treatment or remediation of any deterioration that may have resulted from insects. n.) Reporting on the condition of subterranean conditions, such as underground utilities, sewage disposal systems, underground storage tanks, wells, etc. o.) Providing an opinion on the condition of any system or component that is shut down. However, the consultant is to provide an opinion of its physical condition to the extent reasonably possible, considering its age, obvious condition, manufacturer, etc. p.) There may be other items and systems not inspected or other tests not conducted that are not included in this list. REPAIR COST ESTIMATES ARE NOT GUARANTEED. 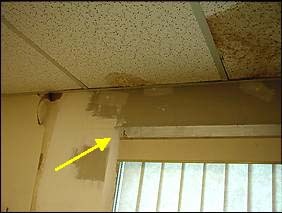 Bona fide estimates should be obtained from licensed contractors. THIS IS A REPORT OF A VISUAL INSPECTION OF THE READILY ACCESSIBLE AREAS OF THE BUILDING, ONLY AND ONLY OF CONDITIONS EXISTING AT THE TIME OF INSPECTION. This inspection is visual only. A representative sample of building components are viewed in areas that are accessible at the time of the inspection. No destructive testing or dismantling of building components is performed. It is the goal of the inspection to put a building buyer in a better position to make a buying decision. Not all improvements will be identified during this inspection. Unexpected repairs should still be anticipated. The inspection should not be considered a guarantee or warranty of any kind. Please refer to the Proposal and Inspection Agreement for a full explanation of the scope of the inspection. The structural plans were not available for the building; however, the building appeared to be steel frame (see pictures #1 and #2, below) on a block and grade beam slab on grade foundation; there appeared to be perimeter foundation footing drains which would be a standard building practice. 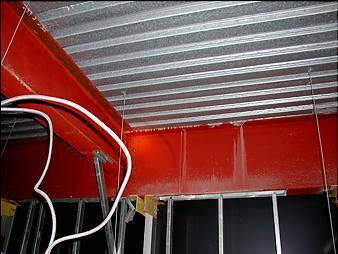 A fireproofing paint had been applied at the steel framing. There was a cellular phone company complex on the building’s roof (with cellular phone components, antennae, superstructure, etc. ); there had been modifications and reinforcement performed to the structure when the aforementioned work was performed (see picture #3, below); however, the determination of the ability of the building’s framing and structure to support such dead loads is not within the purview of this inspection; a consultation with a structural engineer may be advisable and at the client’s discretion. There was evidence of water intrusion at the east foundation wall where the fire protection water main entered the building (see picture #4, below); repairs are recommended. Although firewall separation appeared to be in generally acceptable condition, there were areas of missing firewall separation behind the suspended T bar ceilings in areas including at the 3rd floor northwest corner area, at the 2nd floor south area near HVAC terminal, at the 2nd floor northwest office, and at other areas (see pictures #5 and #6, below); these conditions are not unusual in a building of this age and type and is typically caused by fire separation drywall being either removed or damaged when occasional repair work is performed; areas behind the suspended ceilings were only randomly inspected and there may be additional areas of missing or damaged firewall separation; all areas of fire separation at all floors should be inspected by a competent and licensed contractor and repairs performed where necessary. 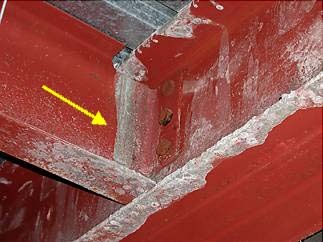 Structural components concealed behind finished surfaces could not be inspected. Only a representative sampling of visible structural components were inspected. Furniture and/or storage restricted access to some structural components. Please also refer to the Proposal and Inspection Agreement for a detailed explanation of the scope of this inspection. 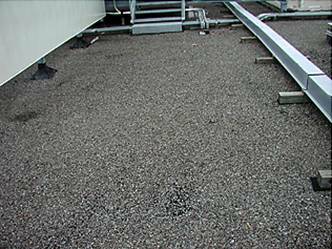 Roof Covering: the main roof and lower roofs were low slope built up roofing with a flood coat of asphalt and gravel, and approximately 14 yrs. old (see picture #1 and illustration below). The roof plans for the building were not available and the roof specifications (including number of roof plys) were not determined. The building was one of the highest buildings in the immediate area and subject to high winds with resultant problems (e.g. 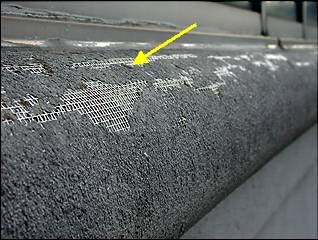 scouring of the roof surface, damage to and premature wear of rooftop components,etc. 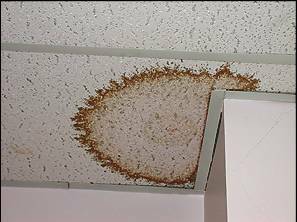 ); the roof should be periodically and regularly inspected. See the Exterior section for commentary on the roof parapet wall. 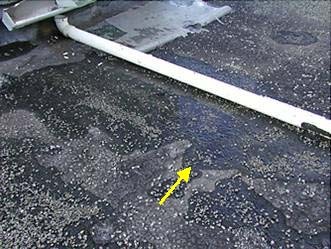 Roof Drainage: the roof drains discharged into subsurface drains; the condition of the subsurface drains could not be determined by a visual inspection; it is recommended that the drains be inspected during periods of sustained rainy weather (or otherwise inspected) to determine the serviceability of the drains. As prescribed in the Inspection Agreement, this is a visual inspection only. Roofing life expectancies can vary depending on several factors. Any estimates of remaining life are approximations only. This assessment of the roof does not preclude the possibility of leakage. 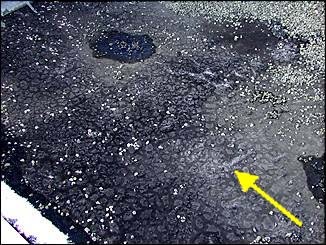 Leakage can develop at any time and may depend on rain intensity, wind direction, ice build up, etc. 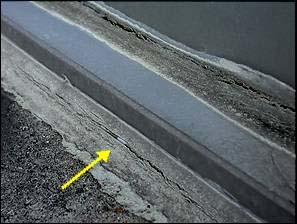 The vertical expansion joint caulking was in significantly worn condition throughout the building exterior (see pictures #1 and #2, below); there were approximately 4-6 vertical expansion joints per elevation; repairs are recommended by a competent and licensed waterproofing contractor. It appeared there had been miscellaneous areas of water penetration at the exterior cladding over the years and spot caulking had been performed when necessary; this including at windows, curtain wall galzing, the intersections of the EIFS and curtain wall glazing etc. 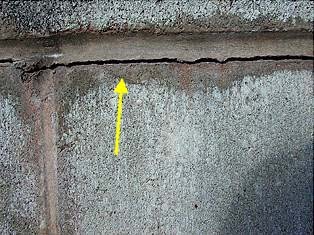 There was extensive deterioration at the “bullnose” trim band (EIFS) that extended the full circumference of the building (between the 1st and 2nd floors) and for approximately 400-500 linear feet (see picture #4, below); the deterioration appeared to be of the base and finish coats and appeared to be primarily caused by water streaming down the exterior cladding and eroding the trimwork over time and/or deterioration caused by retained snow (see picture #6, below); this type of deterioration is not unusual with trimwork of this type; there appeared to be some evidence of water intrusion into the interior space at the aforementioned areas as a result of the aforementioned deficiencies- including discoloration of steel framing just inside and opposite the aforementioned areas (see picture #5, below). There was significant water damage at the 1st floor northwest office and evidence of former water penetration at the exterior cladding at that area (see picture #3, below); repairs had been performed and according to the tenants there had been no leakage since. There was extensive deterioration at most of the roof parapet wall (EIFS) which appeared to be primarily caused by weathering and possibly poor initial quality (see picture #9, below); this damage also appeared to be at both base and finish coats; there also appeared to be some mechanical damage at the parapet wall (contact with ladders, scaffolding, etc.). There appeared to be approximately 400-500 linear feet of parapet wall. There was damage at the front entrance right side column EIFS (see picture #7, below). There was also miscellaneous deterioration at the exterior cladding in areas (see picture #8, below); all EIFS cladding should be inspected when the aforementioned repairs are performed and additional spot repairs performed where necessary. EIFS has encountered a bad reputation in some areas, because of problems with water penetration and resultant deterioration and failure. This is most common in low-rise residential buildings and buildings in coastal regions. This is typically due to poor detailing around penetrations such as doors and windows. 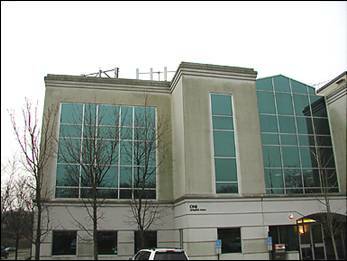 Commercial EIFS is typically of much higher quality than residential EIFS. However, the pros and cons of EIFS will not be discussed here. There was significant dirt, mold, moss growth, etc. at the upper areas of the north side exterior stucco cladding (see picture #10, below) and miscellaneous dirt at other areas of exterior cladding; repairs are recommended at some point in the near future. The curtain wall glazing system (2nd and 3rd floors) was aluminum tube frame with 1 inch insulated glass at windows and ¼ inch glass at spandrels; the curtain wall glazing system appeared to be in serviceable condition where readily accessible and as observed from ground level with binoculars (see picture #11, below); the purview of this visual inspection is only of conditions existing at the time of inspection at readily accessible areas. 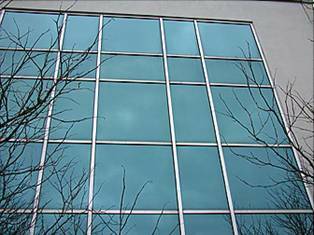 Curtain wall glazing systems are held in place by pressure plates and gaskets. It should be noted that there was a significant amount of curtain wall glazing and much of it not directly or readily accessible for inspection; although the caulking and seals at the curtain wall glazing appeared to be in generally serviceable condition, inspection of the caulking and seals at the curtain wall glazing should be performed concurrently by a competent waterproofing contractor when the window caulking repairs are performed (see Windows, below); special attention should be paid at the intersections of the curtain wall glazing and EIFS cladding. The detailing including flashing details at the glazing system was not inspected and is not within the purview of this inspection; consultations with a certified EIFS inspector, an architect or qualified and licensed engineer may be advisable for analyses. Parking Lots, Parking Spaces, and Asphalt Paving: there were 60 general parking spaces, 21 reserved parking spaces, and 2 handicap spaces. 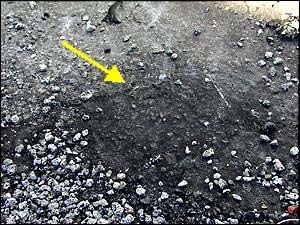 There was wear and evidence of former repairs having been performed at the west side of the parking lot paving at the intersection of the upper and lower areas; obtain further information from the seller. Only a cursory inspection was performed of the asphalt paving; test boring of the asphalt paving would be required for a more detailed inspection and would be a specialized inspection. The condition of the parking lot drains was not determined and is not within the purview of this inspection. Parking Lot Retaining Walls: there were long retaining walls at the middle of the parking lot and at the south end of the parking lot; several of the weep holes at the parking lot block retaining walls were filled with plant roots (see picture #12, below); there was also miscellaneous settlement cracking at the walls in areas which is not uncommon in walls of this age and type (see picture #13, below) repairs are recommended and the weep holes must be kept clear in order to relieve hydrostatic pressure at the walls and to prevent heaving of the walls. Exterior Doors: exterior doors appeared to be in generally serviceable condition. The intercom and door buzzer system was not inspected and is not within the purview of this inspection; see the Proposal and Inspection Agreement. Chimney: the boiler chimney was a metal (B vent) and in generally serviceable condition where readily accessible and as observed at the boiler room and at roof. Grading: the building was positioned on a site that sloped from front to rear (north to south); the building was somewhat elevated above its perimeter grading. 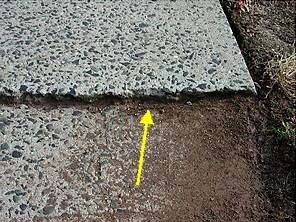 Sidewalk and Walkways: the north side sidewalk (near entrance) had settled and the control joint material or packing had worn away at most areas (see picture #15, below); there was unevenness and tripping hazards at the north side sidewalk (near entrance), and at the south and west side sidewalks (see picture #14, below); there was also a raised utility access at the east sidewalk that posed a tripping hazard (see picture #16, below); repairs are recommended and will probably involve the leveling off of unevenness with concrete (at tripping hazards) and/or the pouring of new sidewalk sections at some point (at the north side sidewalk). A representative sample of exterior components was inspected. The inspection does not include an assessment of geological conditions and/or site stability. Service: the building was supplied by a 800 Amp 480Y/277 3 phase 4 Wire service with the following main disconnects: LPA1: 100A-3 phase 4W; LPA2: 100A-3 phase 4 W; LPA3: 100A-3 phase 4 W; OPPA1: 200A-3 phase 4W; A/C: 200A-3 phase 4 W.
There were 480Y/277 and 208Y/120V panels with step down transformers at the electric rooms at each floor (see picture #2, below); there were two step down transformers at the 2nd floor electric room. The 480Y/277 distribution panels at the individual floors appeared to primarily serve the lighting circuits. The distribution panels at the individual floors were the following: basement: 125A (480Y/277), 60A (208Y/120); 1st floor: 100A (480Y/277), 100A (208Y/120); 2nd floor: 100A (480Y/277), 60A (208Y/120), 60A (480Y/277), 60A (208Y/120); 3rd floor: 100A (480Y/277), 100A (208Y/120). Circuits: the distribution of the electrical circuits was not determined and is not within the purview of this visual inspection; a consultation with a licensed electrician may be advisable at client's discretion for further analysis. 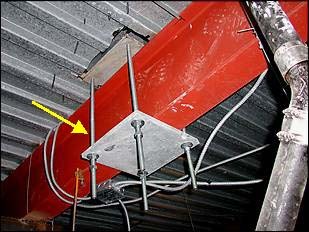 Conductors: branch wiring was copper in conduit in serviceable condition where readily accessible and where randomly inspected. Receptacles and Fixtures: receptacles were randomly tested and were found to be operable and properly wired; the GFI receptacles at the lavatories were operable; the installation of GFI receptacles at the kitchen counters where applicable is recommended (see illustration, below). GFI devices are extremely valuable, as they offer an extra level of shock protection especially at potentially damp areas. GFI receptacles have been required by the National Electrical Code since the 1970’s and at kitchen counters since the late 1980’s. The motion sensor light switches at the 3rd floor offices were not inspected or tested (see picture #4, below). There was a broken toggle at light switch at one 2nd floor south side office; there was no lighting at the 3rd floor east side fire stairs; repairs are recommended. Electric Shock Problem: according to interviews conducted at the premises there had been a significant problem with employees at the XYZ offices on the 1st floor getting “shocked” when operating computers, etc. This appeared to have been caused by the neutral and ground terminals at the 1st floor step down transformer not being strapped together. Repairs had been performed and according to follow-up interviews, the problem appeared to have been solved; obtain further information from XYZ corporation. It was not determined if there was a similar problem at the other floors although there had been no complaints from any other tenant; however, much of the building was unoccupied and interview information was limited. 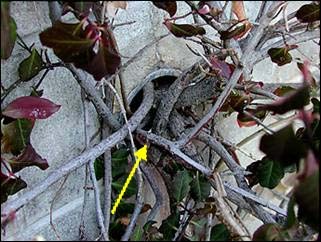 Exterior Transformer: the pad mounted exterior transformer at the west side of the property was improperly obstructed by branches (see picture #1, below); there should be clearance at the front and rear of the unit; corrections are recommended. Parking Lot Lighting: the parking lot lighting was on a timer and was not inspected; also, see the Proposal and Inspection Agreement; a guarantee of serviceability can be provided by the seller that the parking lot lighting is in operable condition. 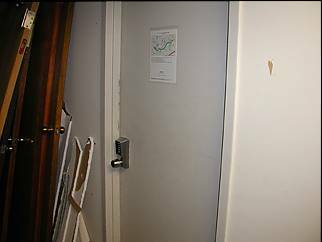 Fire Alarm System: the fire alarm and security alarm systems at the electric room were not inspected (see picture #3, below); also, see the Proposal and Inspection Agreement. · Electrical components concealed behind finished surfaces could not be inspected. · Only a representative sampling of outlets and light fixtures were tested. · Furniture and/or storage restricted access to some electrical components. Heating System: heating was supplied by a gas-fired hot water boiler to baseboard radiation for the perimeter rooms and to a VAV (Variable Air Volume) fan terminal unit for the 1st floor lobby and the hot water fan coil unit for the vestibule. 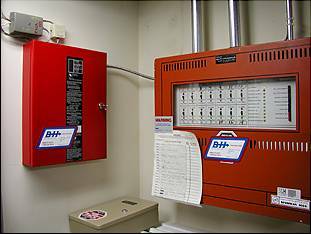 The heating system was controlled by a central controller at the boiler room (see picture #6, below) and by individual wall thermostats at each floor; the wall thermostat controls the cooling of the variable air volume (VAV) terminal, and the perimeter heating (where applicable). There were approximately 10 heating zones per floor. Heating for the warm up period was also provided by a 73KW electric heater at the rooftop package unit and was delivered to four interior terminals. After the warm-up period the terminal supplies cool air to the space. The gas-fired forced hot water boiler appeared to be adequately sized (Input 560 MBH, Output 448 MBH), approximately 14 years old, and in operable condition at the time of inspection (see picture #1 and illustration, below); flame and draft were acceptable and the circulator was operable; the relief valve was releasing at the time of inspection(see picture #2, below); this may be caused by a faulty or waterlogged expansion tank, a defective pressure reducing valve, or due to some other cause; corrections are recommended by a competent and licensed heating contractor or plumber. It should be noted that the boiler is beginning to near the end of its average useful service life; boilers of this type typically last 20-25+ years. 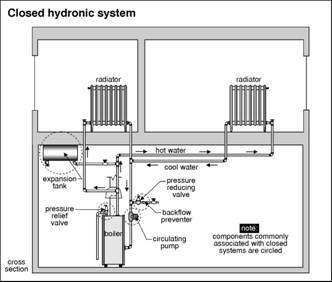 The boiler and hot water pump are controlled by the main controller (at boiler room-see picture #6, below) which resets the boiler water temperature from outdoor and indoor sensors, and cycles the pump on demand. The boiler water temperature is maintained at a minimum of 140 degrees F and is reset upward as the outdoor temperature falls. The controller provides night set back and morning warm-up boost. The night set-back periods are determined by the program clock which accepts a seven day schedule. This system controls the boiler. The rooftop air conditioner is on a separate schedule. The inspection and testing of the heating system controls are not within the purview of this inspection; the entire heating system should be inspected by a competent and licensed HVAC contractor after the air conditioning repairs are performed (see the Air Conditioning/Ventilation section). b.) 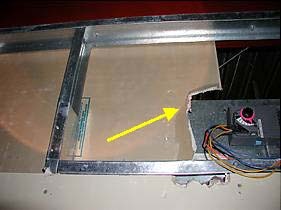 as the HVAC system was shut down at the time of the inspection, the vestibule fan coil unit was inoperable at the time of inspection (see picture #8, below). There was also a fan coil unit that appeared to supply heat to the plenum at the 1st floor lobby and east side offices (see picture #7, below); as the lobby temperature was approximately 78F at the time of inspection, the unit did not activate and, therefore, was not inspected. c.) some of the heating line supply valves behind the 1st floor suspended ceilings were dripping and leaking onto ceiling tiles below (see pictures #4 and #5, below); most of the leaky valves were at the 1st floor east side offices; all valves should be inspected by a competent and licensed heating contractor or plumber and repairs performed where necessary. 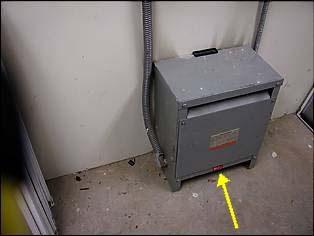 d.) there were missing or damaged baseboard convector housings in areas at the 3rd floor offices (see picture #3 and illustration, below); repairs are recommended. 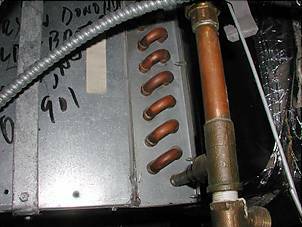 Overall, from observation of the system and through interviews of the owners and tenants, it appeared that the HVAC system (including the hydronic heating noted above) had been poorly maintained over the years and with only spot or sporadic inspections and with “stop gap” repairs; there was no evidence of a current maintenance contract; obtain further information from the owner. · As prescribed in the pre-inspection contract, this is a visual inspection only. The inspection of the heating system is general and not technically exhaustive. 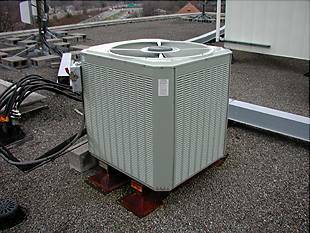 HVAC System: the HVAC system was a Carrier rooftop package unit, model # 50DL064, approximately 55 tons capacity, and approximately 14 yrs. old; the package unit incorporated two compressors; compressor #1 had been replaced recently at the cost of approximately $8000 according to the building manager (see picture #1, below); compressor #2 was inoperable at the time of inspection (see picture #2, below); in addition there was a problem with the main fuse serving the system (also according to the building manager) and the system had been entirely shut down for repairs (see picture #3, below). Consequently, there was no air conditioning or ventilation (see commentary below) at the time of the inspection and the system could not be operated or inspected. Note: this consultant is not required to provide an opinion on the condition of any system or component that is shut down. However, the consultant is to provide an opinion of its physical condition to the extent reasonably possible, considering its age, obvious condition, manufacturer, etc. 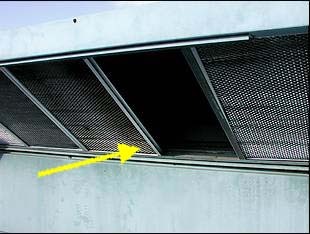 Two of the mesh filter screens were missing at the rooftop package unit air intake (see picture #4, below); corrections are recommended. HVAC Distribution: the distribution system was a variable air volume system (VAV) with electric damper actuators at terminals (moduboxes); approximately 1/3 of the electric damper actuators (see picture #5, below) had been inoperable and had been recently replaced according to XYZ Engineering, who had performed the repairs recently at the HVAC system; replacement of other original units may be necessary in the not so distant future. There was a loud buzzing being emanated at the 3rd floor west side electric damper actuator circuitry; this should be further reviewed by a HVAC contractor when the other aforementioned repairs are performed. There were two condensing units located at the northeast and northwest areas of the roof (see picture #6, below); the northwest unit was inoperable according to the seller and served a prior tenant at the building; the northeast unit appeared to cool the cellular phone room at the basement (this room was locked and not accessible to this inspector); these units were not inspected. Ventilation and “Sick Building” Syndrome: the term “sick building syndrome” applies to any building in which a significant portion of the occupants, usually more than 20%, experience a set of symptoms, including headaches, fatigue, etc. that ameliorate when the affected persons leave the building. Many of the tenants interviewed by this inspector complained of such symptoms. In addition recent environmental testing performed by the XYZ Environmental Corporation (performed on 10/9/02) determined that there was unsafe carbon dioxide levels at the 1st and 2nd floors; this information was provided by Mr. John Doe of XYZ Systems (tenant on 2nd floor); obtain further information and a copy of the report from Mr. John Doe. The entire HVAC system (including-but not limited to-the package unit, fresh air intake and economizer modes, hot water boiler system, all heating and cooling controls, fan coil units at the lobby and vestibule, the entire distribution system, etc.) should be thoroughly tested by a competent and licensed commercial HVAC contractor after repairs are performed and prior to closing. A service contract should be obtained from a competent and reputable HVAC contractor so that the entire system operates normally and so that the chronic and long-standing problems of the past are eliminated. · As prescribed in the pre-inspection contract, this is a visual inspection only. Air conditioning and heat pump systems, like most mechanical components, can fail at any time. 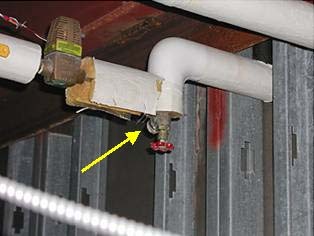 Water Service: there appeared to be separate water mains for the building water supply and the fire protection system; there was a 2 inch copper water entry line for the building water supply (see picture #2, below); both services entered the building at the south foundation wall. Interior Pipes: interior water piping was copper and in serviceable condition where readily accessible. 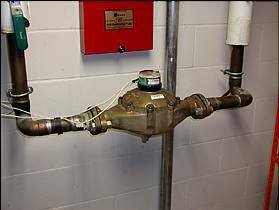 Natural Gas Service: the natural gas service (and gas meter) was located at the south side of the building. Building Sewer: the plumbing plans were not available the type and description of the building’s waste system was not determined; obtain further information from the seller; the building sewer lines were not located and the inspection of same is not within the purview of this inspection. The storm drains, detention field, etc. were not inspected; further review by a licensed sewer cleaning contractor or licensed plumber may be advisable at the client’s discretion. 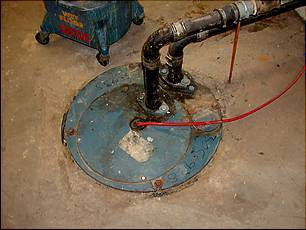 There was a sewage ejector pump at the south basement room (see picture #4, below); the unit was not tested and the testing of same is not within the purview of this inspection. 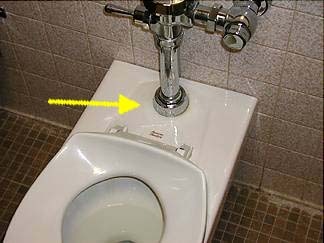 Lavatories: there were men’s and women’s lavatories at each floor; both toilets at the 3rd floor ladies lavatory were leaking at flushometer plumbing (see picture #3, below); repairs are recommended by a competent and licensed plumber. There was slow drainage at the 3rd floor ladies lavatory right side sink which is probably as a result of localized clogging; corrections are recommended at some point. Rooftop Ventilator for Lavatories: the rooftop ventilator fan serving the lavatories was either shut down or inoperable; as a result there was inadequate ventilation at the lavatories; this deficiency was confirmed by the tenants who all complained of inadequate lavatory ventilation; system may be controlled by a timer and timer requires adjustment or repair; corrections or repairs are recommended prior to closing. 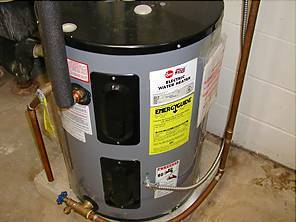 Water Heater: hot water for the lavatories and kitchen sinks was provided by an electric 30 gallon water heater; the unit was 3 yrs. 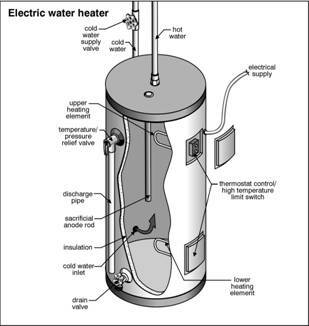 old, and in operable condition (see picture #1 and illustration, below); units of this type typically last 10-13+ years; water heaters generally need not be replaced unless they leak; required safety devices were present. Dishwashers: there was one dishwasher per floor at kitchens; the 2nd floor dishwasher was inoperable; repair of the installation of a new unit is recommended; two of the three dishwashers were at the end of average useful service lives; repair or replacement of the units may be necessary in the not so distant future. Portions of the plumbing system concealed by finishes and/or storage (below sinks, etc. ), below the structure, and beneath the yard were not inspected. Water quality is not tested. 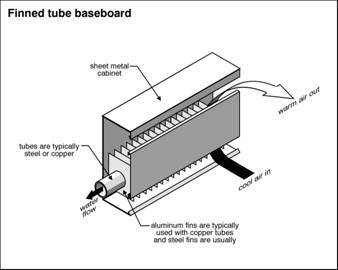 The effect of lead content in solder and or supply lines is beyond the scope of the inspection. Floors: floors concrete in generally serviceable condition and reasonably level where readily accessible; however, all floors were fully carpeted and the floor underlayment was not readily accessible and not directly inspected; carpeting would have to be removed for a full and comprehensive inspection of the flooring; the purview of this visual inspection is only of conditions existing at the time of inspection at readily accessible areas. 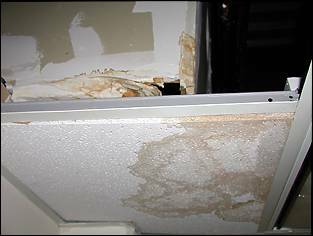 Walls and Ceilings: there was water damage at the 1st floor northwest office as a result of former water penetration at the EIFS cladding (see picture #2, below); repairs are recommended; also, see the Exterior section for further commentary. Fire Stairs: the fire stairs and railings were in generally serviceable condition. 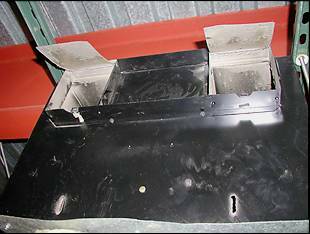 Doors: inside doors were in generally serviceable condition and opened and closed adequately. 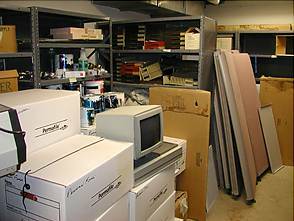 Basement: the basement was partially finished; visual access at the basement was restricted or denied as a result of stored office goods (see picture #2, below); there was no access at the cellular phone company room (see picture #3, below); the purview of this visual inspection is only of conditions existing at the time of inspection at readily accessible areas. Basement Floor: the concrete slab was in generally serviceable condition where readily accessible. Basement Dampness and/or Flooding: there was no evidence of any systemic basement dampness and/or flooding problems at the time of inspection as observed at readily accessible areas of the basement. According to the building’s manager there have been no problems with basement dampness and/or flooding. 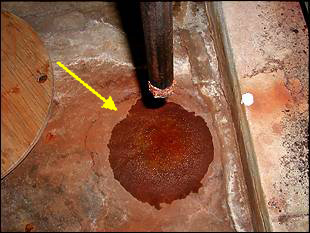 Representative areas of the interior foundation were tested for dampness and were found to be acceptable by the moisture detector. The purview of this visual inspection is only of conditions existing at the time of inspection at readily accessible areas. It is recommended that the client inspect the premises during a period of sustained rainy weather to determine the existence of basement dampness and/or flooding under those conditions. Furniture, storage, appliances and/or wall hangings restricted the inspection of the interior.